It has been a while! Again! But I got some commissions that I am very excited about and happily working on. After the Renoir exhibit we visited the National Museum of Natural History. We only completed one floor so we need to go back to see the rest. It was amazing! They had a never-ending collection of gems and minerals including the Hope Diamond. and a moai from Easter Island! Even the last passenger pigeon, Martha, was there. We also went back to the National Gallery to see the exhibit, Vermeer and the Masters of Genre Painting. The exhibit was good but was missing "Girl with a Pearl Earring," which is what I was really hoping to see. Jeff of course has seen it already. 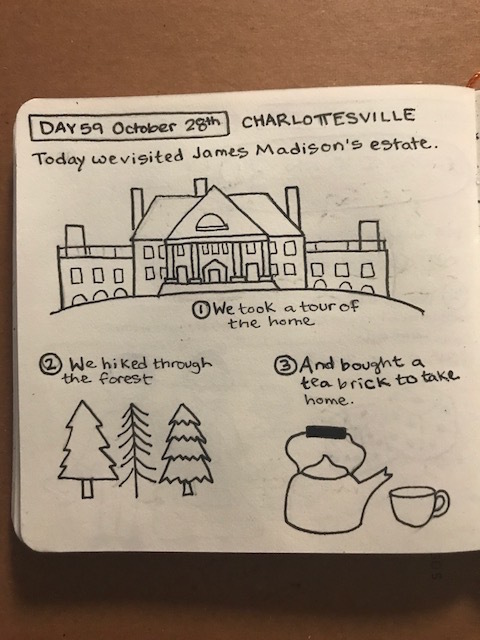 We also took a little trip to Charlottesville to visit some presidential homes. Last time we came to D.C. we visited Jefferson's Monticello and Washington's Mt. Vernon but did not get to Madison or Monroe. We also thought it would be cool to see the Woodrow Wilson Presidential Library and Museum which includes a tour of the historic home he was born in. We got to Charlottesville Thursday night. The next morning, on my birthday, we got up early with plans to spend the day at James Monroe's Highland. But when the tour guide started with "this is where Monroe's home would have stood had it not burned down," Jeff and I knew this was not a winner. Yea so no actual home of James Monroe. Part of his guest house still remains but the main house was built by the people who lived on the plantation after Monroe. Not exactly what we came to see. We got there about 9:30am and were ready to leave by 11. We had planned that day to visit Mitchie Tavern if we had time. Sunday we planned to visit the Woodrow Wilson house. But plans change. We decided to do both that day and then Sunday take a day trip to Richmond. When we were planning the trip neither of us had much interest in seeing the tavern but it was the best part of the day. It is a historic tavern from the time of Jefferson. They offer self-guided tours and you can of course fill up on fried chicken and other Southern classics. We did the tour. During the tour the hostess showed us a colonial game called "Shut the Box". I won! And because it was my birthday she also taught Jeff and I a colonial dance called the "Promenade". The Woodrow Wilson Library and Birthplace was not a huge hit either. Most of the people on the tour were considerably older. One particular man really wanted to talk about a nearby railroad that didn't have much to do with Woodrow Wilson's birthplace. That was... special. I had a wonderful birthday dinner with my love. It was very Southern but with vegetarian options! Just what I wanted. The next day we had plans to visit James Madison's Montpelier. After visiting Monroe's plantation we were a little nervous it might not go so well but it was excellent. First we took a tour of the house. I loved learning about Dolly Madison and Jeff thought our tour guide was excellent. After the tour, we took a walk through the forest and gardens and then finished the day with a tour about slavery at the plantation. Sunday we took a walking tour of historic Richmond and walked along the canal. The tour was just alright. We got some lunch afterwards and before being seated we were asked, "Smoking or non-smoking?" I didn't know that was still a thing. Weird. After lunch we went to the Edgar Allen Poe Museum. They had a fantastic reading of the "Tell-Tale Heart" and lots of black cats wandering around. Jeff and I got a collection of his poems and short stories to read to each other. On Monday while we still had the rental car we went for a hike at Great Falls Park. The views were really great. For Halloween we binged on Stranger Things 2 and candy. Since we have been back in Arlington we visited two more museums. We went to the National Museum of Women in the Arts. The museum was only okay so we went back to the Smithsonian American Art museum to see the Kara Walker exhibit. This past weekend we went to the National Museum of the American Indian but that was also a disappointment. We wanted more. There was one exhibit I enjoyed called The Great Inka Road: Engineering an Empire. Our time in D.C. is growing short which makes us sad. So we are trying to find time to finish projects, read for hours, and still see everything on our list. More adventures to come. Thanks for reading.